Here’s the scenario: A mother in North Carolina packed a lunch for her pre-schooler and dropped her off at school. 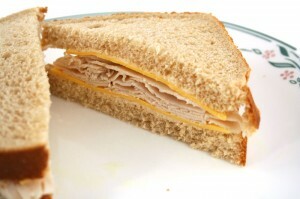 The mother was unaware that the turkey and cheese sandwich, banana, chips and juice would be inspected by the school to see if the lunch met USDA guidelines – mandated for all pre-kindergarten programs. Of course, she found out about the inspection when her daughter came home with the uneaten lunch and a bill for $1.25, the cost of the approved cafeteria lunch that was provided her to replace the “nutritionally unbalanced” sack lunch. Read the original article here. What did the toddler get for $1.25? We only know that she ate three chicken nuggets, and that the rest of the nutritionally approved lunch, whatever it was, went in the trash. Let’s see, three nuggets (no doubt made from yummy mechanically separated chicken laced with flavor enhancers and modified food starch, fried in bleached, deodorized, or partially hydrogenated vegetable oil), or a garden variety turkey sandwich? OK, from my Weston A. Price influenced point of view, I doubt that the sack lunch was made with pastured turkey in the ‘wich, and the chips, probably fried in the same kind of oil as the nuggets. But that’s really not the point, is it? This situation is wrong on so many levels. Let’s start with the very notion of inspecting food in the first place. Second, let’s look at the concept that any individual meal will only be healthy if it follows the model set by the USDA-approved food pyramid (the apparent criteria for evaluating the toddler’s lunch in the first place). Third, the notion that school staff can override parents about something as basic as what lunch they provide for their children – or that a school would even consider green-lighting such a practice from an outside agency. The brown-bag lunch was clearly put together with some thought, based on foods the mother knew her daughter would like, and come on, folks, it’s got some pretty basic foods represented: meat, bread, cheese, fruit. Apparently it was missing vegetables. But the little girl didn’t particularly like vegetables, so her mom made sure that she got them at other meals where her mom could make sure she ate them. Did parents at this school know before this well-publicized incident that they were expected to ensure balanced lunches that would be inspected and potentially confiscated? Of course not. There are so many other approaches the school could take, if it wanted to be pro-active about nutritional content of lunches: they could send home guidelines, or suggested meal ideas. But parents should have the option to follow those guidelines – or not. Which gets to the issue of schools (or any other institution) having more authority over a child’s diet than the child’s parents. Again, you might think the food pyramid is the bomb. You might be worried about childhood obesity, or how childhood diet might influence future health issues. But are you really comfortable with the notion of a school taking your child’s lunch away without letting you know about it, with all the stuff that can go along with that, like upsetting your child? What if you believe, like I do, that I would want a child to eat lots of pastured eggs and full-fat, whole milk cheese and grass-fed meats? What if you believe, like I do, that the food pyramid is no more than lobby-influenced agribusiness hype? How am I going to be able to even send a lunch to school in the first place that my child would be able to eat? And what are the implication for parental rights in all this? What other parental decisions can the school override without permission? California just made it legal for a school to offer Gardasil to high-school students without their parents’ knowledge. Whether or not you think that vaccine is good or bad, don’t you think that you should be the one to decide when your daughter (or son, since it’s now being recommended for boys as well) receives any vaccine or drug? Sure, the school ended up apologizing to the mother of the child whose lunch was seized. That’s more than appropriate. But the fact that this happened at all should give us all a moment’s pause. Update: A second mother at the school has come forward to say that the same thing happened to her four-year-old. Read the article here. This entry was posted in Food politics, Food safety, Health, Nutrition and tagged food police, food pyramid, parents, school lunch, USDA by Blochster. Bookmark the permalink.